Pure K9 premium optic crystal clock. Art Deco inspired design will fit into any modern office or home. Plenty of space to engrave your special message. Jade crystal and lacquered wood combine forces to create a Theme-Award designed expressly for one whose talents and drive have eclipsed the competition. This play on passing circles and shadow is an artistic representation of heavenly eclipses. The aluminum rods complete the theme as they point to a future that sparkles eternally. 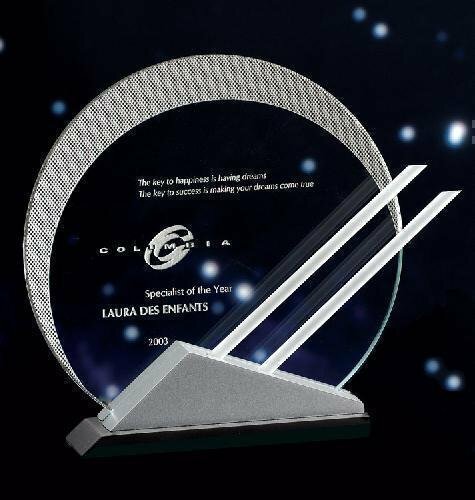 For aesthetics we recommend etching your award inscription and positioning your logo as shown. A romance card elaborating on this theme is included for your presentation.